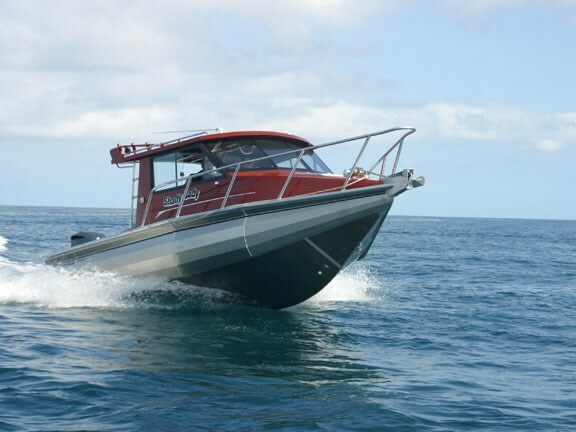 Tough, roomy, safe, comfortable, fast, the Senator RH780 Widebody is an attractive deep-sea proposition, ideal for overnighting. 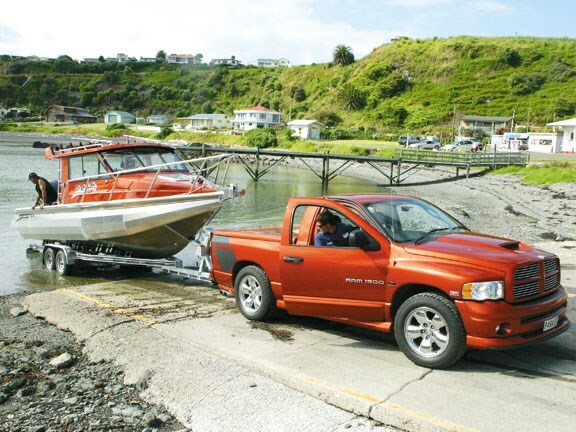 The largest of Senator’s pontoon models, the RH780 Widebody was first launched at the 2006 Hutchwilco Boat Show in Auckland, where it won the Alloy Boat of the Show award. The standard hull boasts an overall length of 7.97m and a beam of 2.7m. Towing requires flags and an over-width permit. It has a towing weight of around 2.5 tonnes. 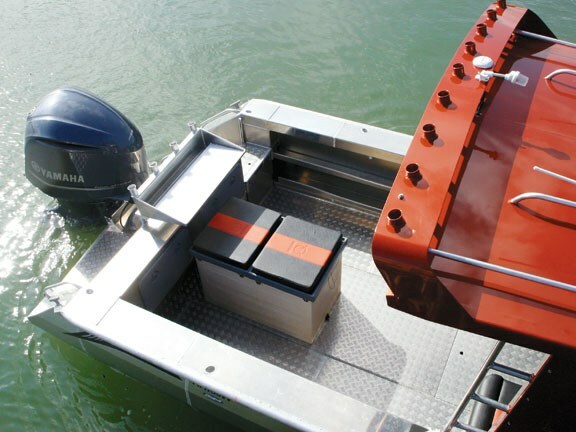 The reserve buoyancy/stability is inherent in the pontoon design – the boat carries five, individual, pressure-tested compartments. On the bottom you’ll find 6mm plates, with the pontoons fabricated from 3mm plates, and 4mm/3mm for topsides. Deadrise trails to 18° at the transom. 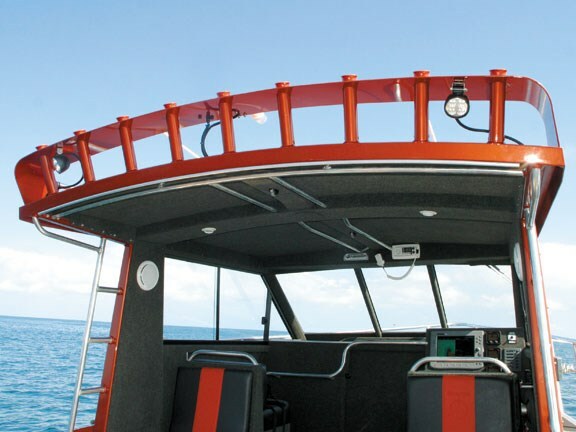 Hulls are built to survey standard and come with a three-year warranty. Owner Eddie Parkinson’s boat (Shady Lady) looks like the standard RH780, but there a number of subtle tweaks. Chief among them is the slightly longer cabin (200mm) to create roomier accommodation, requiring a small sacrifice in terms of cockpit space. Usually set up for three, Senator’s fabricators fitted a fold out pipe-cot on the starboard side of the cabin so this boat sleeps four. An electric toilet is up front below the squabs. A sliding door and fully-carpeted surfaces help to keep the interior temperature toasty. Other additions include a pair of outriggers, windscreen wiper and two vertical handrails on the trailing edge of the hardtop that have been turned into small ladders (Parkinson says they are for the spotter). Shady Lady carries a live bait tank, two cavernous floor lockers (four + dive tanks), a wash-down facility and an arsenal of rod holders. LED lighting has been installed for night fishing, fitted into the roof on the hardtop, on the aft end of the hard top roof, and under the parcel shelves either side of the cockpit. Parkinson has also fitted underwater LEDS under the Portofino-style transom’s boarding platform – proving an "irresistible" attraction for fish. A Raymarine C120 chartplotter/sounder takes pride of place on the large dash, and Parkinson has had it mounted to the left, so he can see it from the transom. 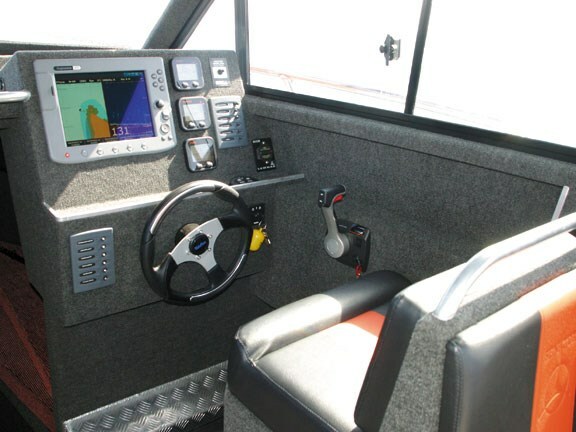 It leaves plenty of space for the Yamaha gauges, Lectra trim tab controls and a bank of switches. Carpeting softens the alloy construction, and there is a shelf immediately below and above the dash. The king and queen seats are fixed, and sport handrails on the backrests. There’s plenty of locker space below the seats. 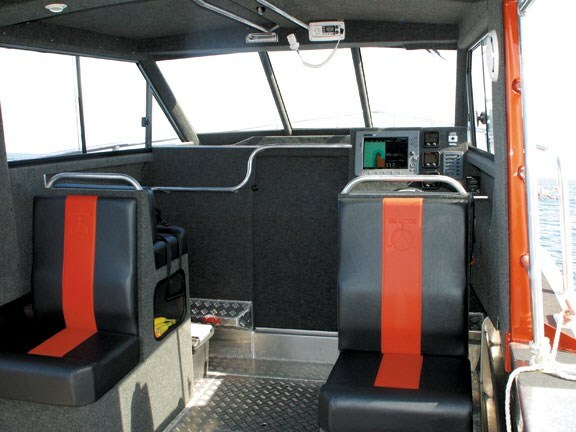 The VHF and stereo are mounted midships, above the cabin entrance. You won’t be short of wrestling room in the cockpit, and the chequer-plate deck provides a firm foothold. A 275-litre fuel tank nestles under the deck. 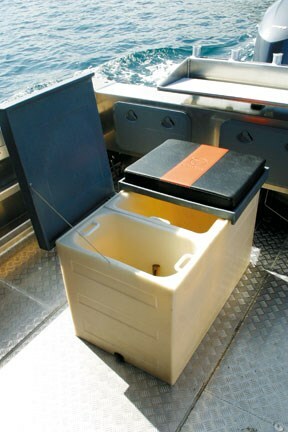 Wide gunwales offer an easy perch and good thigh support, but you might consider fitting them with non-skid. The boat’s fitted with a big Lewmar windlass, easily controlled from the helm. With all that space in the cockpit, Parkinson as elected to fit an additional catch locker, covered with vinyl squab for more seating. The RH780 is rated for 200 - 300hp with a 275-litre underfloor tank. 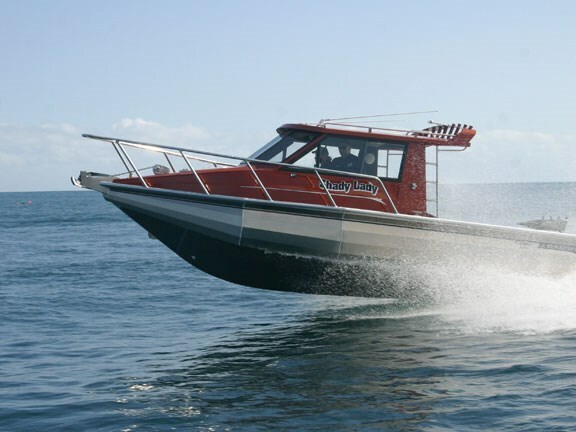 Shady Lady is fitted with a four-stroke, 300hp V8 Yamaha outboard. "Quiet and smooth, it’s perfect for trolling at 8 – 9-knots," says Richardson. Cruising at 42km/h, the engine’s turning over at 3,400 rpm, and according to the Yamaha fuel meter, consuming 38 litres/hour. 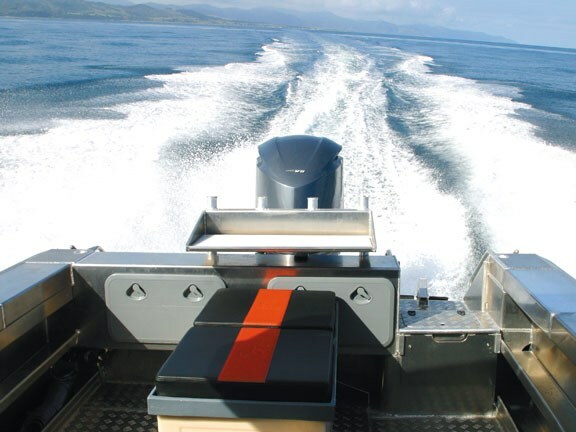 Nudge the throttle forward to 5200 rpm, and the boat accelerates smoothly. At 67 km/h, the thirst-factor climbs to 102 litres/hour. 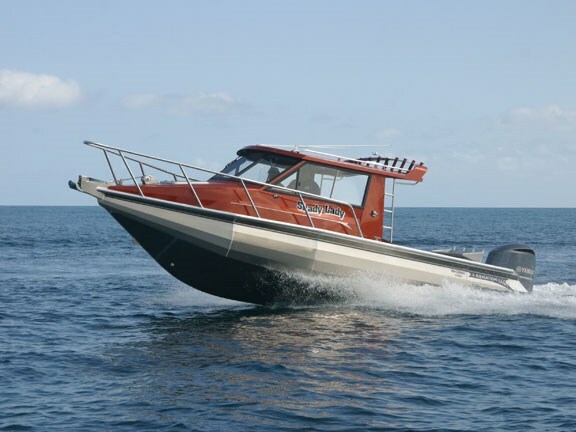 The engine gives the boat a nice agility – the hydraulic steering’s a pleasure to use, and you never feel that the boat’s struggling or fighting the water. Read the full review in the February issue of Trade-A-Boat magazine, on sale now. See a range of Senator boats for sale here.